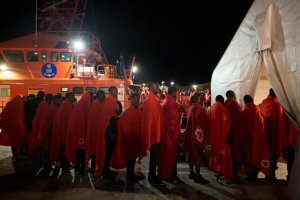 The number of migrants who died or went missing attempting to cross the Mediterranean fell by more than a quarter in 2018 over the previous year, to 2,262, the UN Refugee Agency (UNHCR) said Thursday. The number of migrants who arrived in Europe after surviving the sea crossing also dropped by roughly the same proportion last year to 113,482 after 172,301 in 2017, according to the UNHCR’s full-year figures. ‘The Mediterranean has been for years the most deadly sea crossing in the world for refugees and migrants,’ UNHCR spokeswoman Celine Schmitt told the AFP news agency in Paris. Rescue boats carrying migrants also sparked repeated flare-ups among European countries in 2018 after Italy’s populist government closed its ports to charity-run ships which pick up stranded migrants. Syrians were the fourth biggest group (9,839), followed by Afghans (7,621) and Iraqis (7,333).